A bright green community hall, toddlers shrieking, adults chatting, knifes and forks knocking against plates. The air’s filled with scents of ginger, garlic, myriad spices and the mouth-watering smell of baking bread. I’m in my second week of volunteering for the charity Made in Hackney local kitchen and we’ve just sat down to a freshly made vegetable curry after a free ‘Cooking for Life’ class at Lea View estate in Springfield Park E5. I’m starting to get a good idea of how the charity works, who benefits from it and how much hard work and dedication goes in to running the whole operation. Chef Fi, and volunteer hosts Malin and I have been leading weekly cooking lessons as part of a free six-week course for residents of Lea View Estate. So far we’ve successfully made some ambitious sounding recipes. Week one we rustled up a kale, basil and mixed seed pesto, along with wholemeal bread rolls to dip in to a carrot, coriander and tahini dip. Week two saw that delicious mixed vegetable and coconut curry polished off in minutes at the end of the session. Having had ten little helpers from the nursery downstairs as our regular participants, we have certainly had to think on our feet to come up with recipes and methods to keep the kids, as well as the adults, engaged. Fi’s been beginning the sessions with a ‘guess the veg’ game. She brandishes our (grubby) seasonal, organic vegetables and herbs, one by one, for the kids to name then touch and smell themselves. The gasps and giggles and occasional ‘eeeurgh!’s that echo as they pass around the weird and wonderful roots and leaves, sets the scene for the next two hours of culinary discovery. By this time, we’ve started to have a few more curious faces peeping their heads around the door to see if they can join in. 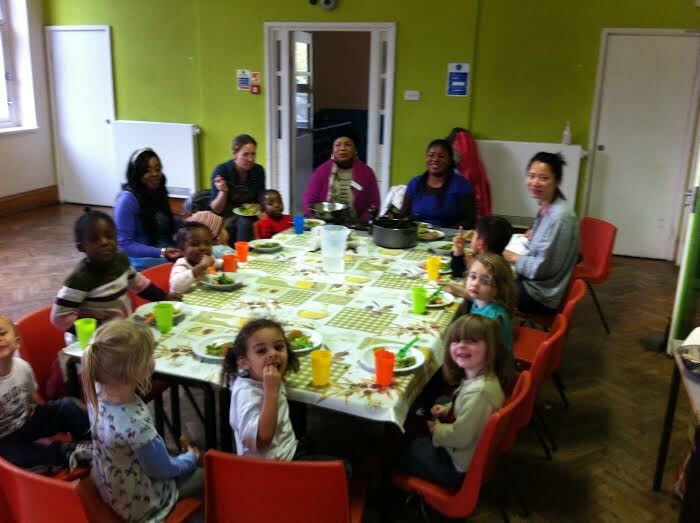 The nursery carers, a handful of parents and other occupants of Lea View pull up a chair and get stuck in scrubbing carrots and potatoes, kneading dough, and tearing up kale and spinach. With the cooking, and inevitably the kids, as the focal point, the class becomes this wonderful team of cooks and clearer-uppers, happily getting involved with some of the slightly more motor-skill reliant tasks like chopping, spice-crushing and washing up. This all forms the sense of collectiveness and community that I’ve found to be the constant atmosphere at Made in Hackney events. Anyone is welcome, everyone is there to learn (including Fi, Malin and I) and we’re all joined in our aim to produce a delicious, healthy plate of food to sit down to at the end of the class. This is the time when we get a chance to recipe-swap, share advice for recreating the recipes at home, and of course, fill our bellies with the meal that we have all had a part in creating.